Opening at the overnight low, there was a brief look below and rejection. We then got slow and low confidence moves higher, churning back and forward until hitting a wall of passive sellers into the 46.50-47.75 area which halted the advance. The NYSE advance/decline had trended higher from -1000 up to nearly +600, which was a supportive factor in continuation higher but order flow was clearly not supportive in the ES futures. 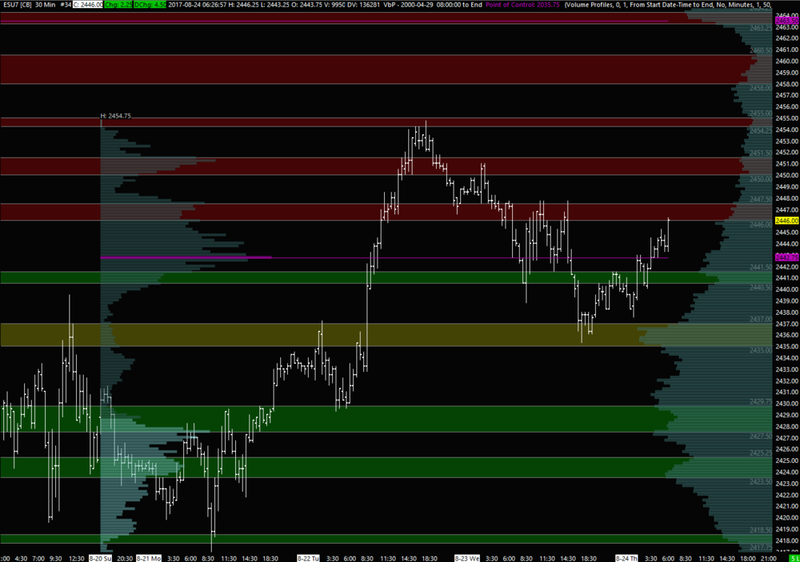 The triple TPO poor high on the profile above will be a spot buyers are likely to attempt to break going forward. Overnight so far we've seen a move lower back down to test the bull/bear zone, which found buyers. Bias remains neutral/bullish above that zone but still expecting sellers to be active at the resistance zones on first test. Will be closely watching order flow and underlying market internals for better clues in real time.